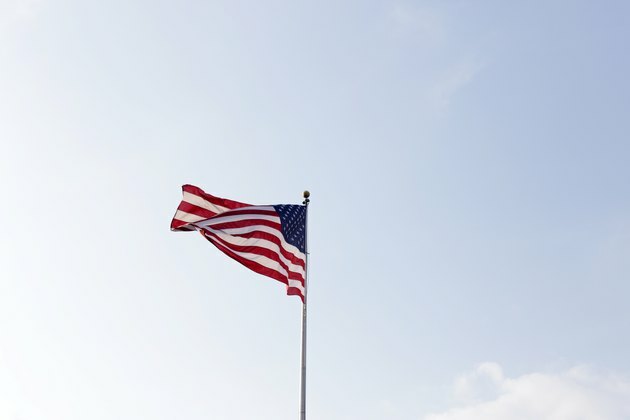 A clean and beautiful flag flying atop a tall flagpole is a symbol of freedom and independence. However, flagpoles are often made of bare or painted metal and by themselves can be unattractive. By using creative landscaping techniques, you can make the area around the bottom of the flagpole an eye-catching and attractive transition from the existing landscape, while still allowing access to the flagpole for maintenance. Designate a half-circle, or semi-circle in the front of the flagpole or the area most likely seen by the observer. The flagpole should be located in the center of the flat side of the circle, as the landscaping is designed to draw attention to the flagpole. This is a good way to highlight a flagpole on an area that slopes toward the viewing public. 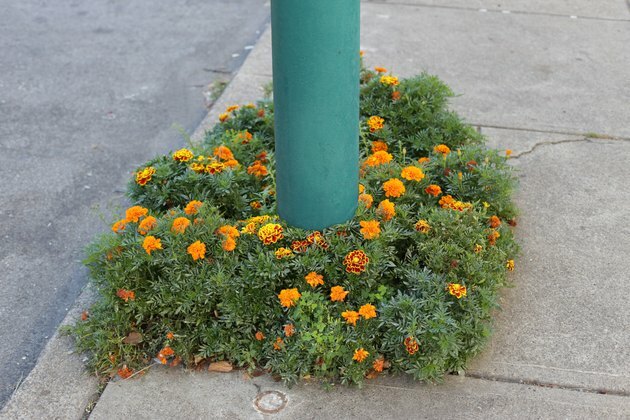 If using a mixture of plants with different heights, plant the lowest- growing plants in the front of the half-circle and taller plants near the flagpole. This creates a transition from the surrounding landscape. A circle naturally draws the eye of the observer toward the middle of the circle. You can highlight the flagpole by surrounding the flagpole with a circle of vegetation. The circle should be in balance with the size of the flagpole and landscape. For example, a small circle of plants around a large and tall flagpole looks out of balance. Concentrate on planting colorful annuals and perennials with similarly colored foliage or flowers. Plants of one color draw attention and make a bigger impact than a variety of colors and textures. Don't forget to add an access point to the flagpole. Larger plants should be planted closest to the flagpole and none larger than one-third the height of the pole. Plant a semi-circle of evergreens with the same growth habit, such as Italian Cypress (Cupressus sempervirens) for US Department of Agriculture plant hardiness zones 7 through 10. Or plant attractive hedges around and behind the flagpole in a semi-circle. The flagpole will be at the flat side of the semi-circle. Then, add paving stones around the flagpole and up to the evergreens or hedges. Add lights at ground level that flood the shrubs and the flag with light in the evening for a dramatic affect. 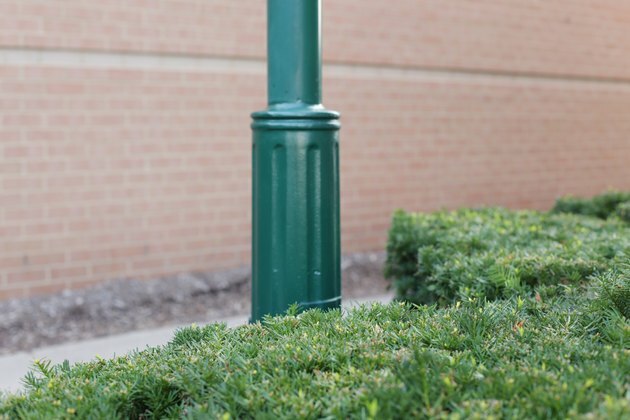 For ease of maintenance, you can simply create a weed-free circle around the flagpole and cover with several inches of mulch or gravel. Then, near the pole, add one or three attractive and drought-resistant blooming shrubs of the same type such as salvia (Salvia spp. ), with species for USDA zones 5 through 9, or seasonal plants, such as tulips (Tulipa spp.) with varieties that grow in USDA zones 3 through 8. Keep plants no more than one-third the height of the pole. This creates a balanced look with minimal maintenance. 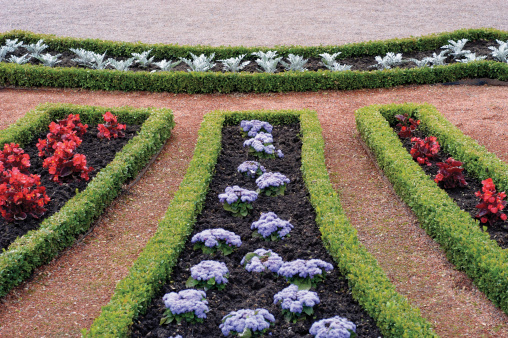 In landscaping, an odd number of plants looks better in a group than an even number. This is a basic rule of design. Add a few stepping stones over any bark mulch for easy access to the flagpole.